Gentle and Easy ironing. Even backwards. Steam shot up to 170 g/min, even vertically - perfect for removing creases in curtains and garments. The improved anti-drip system ensures that no water escapes from the soleplate, even when ironing at low temperature. Ideal combination of 2400 W power output and steam emission for a great end result. After 8 min in vertical position or 30 seconds in a horizontal position for safety and energy saving. Ready for ironing with Max setting in 35 Seconds. Easy and convenient system to clean the soleplate from scale particles. 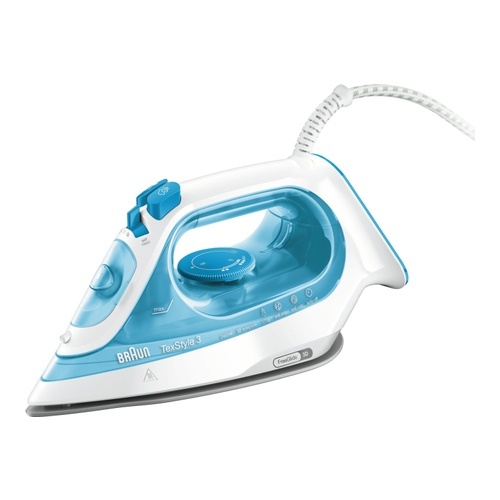 The TexStyle 3 steam iron makes your ironing more gentle and easy, even when ironing backwards. The iron automatically shuts off after 8 minutes in vertical position or 30 seconds in a horizontal position for safety and energy saving.